No matter where or when you choose to vacation, it's always hard to relax when you're worrying about the happiness and care of your furry companion. 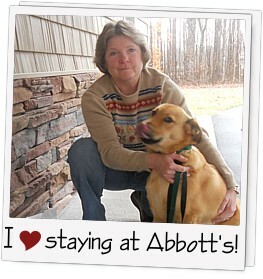 So when you leave town, send your dog on a vacation at Abbott's. Please note that we require reservations for boarding and daycare. Print our Boarding Application now and fill it out to save you time when you arrive. Before bringing your pet in for a stay, please have vaccine information faxed from your Veterinarian. Our fax number is 336-370-8498. The Veterinarian on call for emergencies is Dr. Rodger Kleisch at Forest Oaks Animal Hospital, unless you specify differently. All prescriptions need to be in original doctors bottles and we must follow doctors instructions. The Pet Pantry chicken & rice is our choice of food. If you wish to bring your pet's favorite food, we will happily dispense it to your pet. The food must be provided in an air tight container. We strongly encourage you to treat your pet for fleas before visiting. We only recommend flea medication that is provided by a Veterinarian, such as Frontline, Advantix, Capstar and Comfortis. Peanut Butter biscuits are given as treats. Baths and comb/brush outs are recommended especially after long stays. Our boarding rates include 2 walks a day, extra times a day is available for $3.00 a day. Attention for your pet is expected and freely given. Day Boards are $10 / day but vaccines must be up to date. If your pet is not accustomed to being boarded or new to us, please call and setup a free "get to know us day" so that when the need arises, the stay won't be so traumatic.